With the increase in the percentage of people living in poverty in New York, many believe the next mayor’s agenda should focus in decreasing the inequality gap. Lythcott votes in every election and believes this as well. 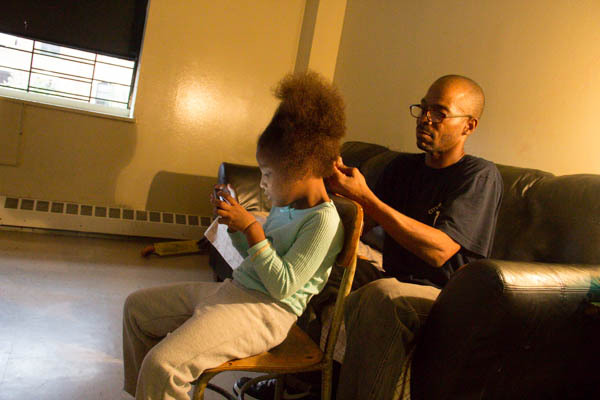 Below is an intimate look at Lythcott with his youngest daughter Drea, doing her hair while he waits for dinner to be ready. Lythcott preparing Drea for bedtime. That’s a powerful image. It does say a thousand words. Powerful image. It does say a thousand words. Thanks Jerome. When he started doing his daughter’s hair, I got the camera with the quickness, lol. Thanks Terry. It was a great story to highlight and I thank Andre for letting me see a snapshot of his life.